Daddy headed back to Texas today, not coming back unless something changes (so we hope he isn't coming back!) Hopefully we will join him back in Texas soon! Its just Ruth and I now, feels strange not having a "support person" anymore. Me-maw is coming in a week to visit for a bit, we are looking forward to seeing her! Ruth received a bunch of super cute preemie outfits in the mail yesterday from family and friends. Thanks ya'll! Today was a good day. I went up to see her at her early morning feeding, to find out my sweet girl is now 4lb 0.5oz, and she also lost her umbilical cord stump! My little preemie is getting bigger! It is great to read that you two are doing well. I am thrilled to see how Ruth is growing. All that walking well definitely help you through your C-section. It just takes time. Love you guys. Hi Sara, Not sure if you're receiving regular emails and this is the only forum I read but saw your Twitter post on the side bar. 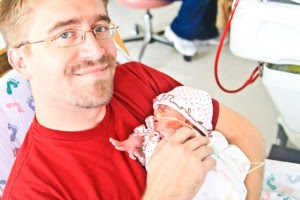 Valerie was born at 35 wks b/c my water broke and was in NICU for 8 days and it seemed the longest 8 days of my life! Soo, I understand about things not moving quickly and just wondering why they were holding my baby girl "hostage". I swear that's how I felt and it was only for 8 days!